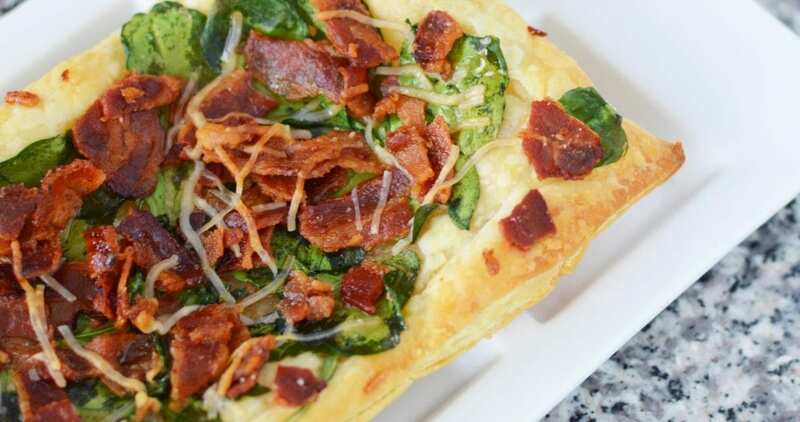 If you read this blog, then you know we love bacon. I mean, we really really love bacon. Let’s be honest here. Bacon is incredible. 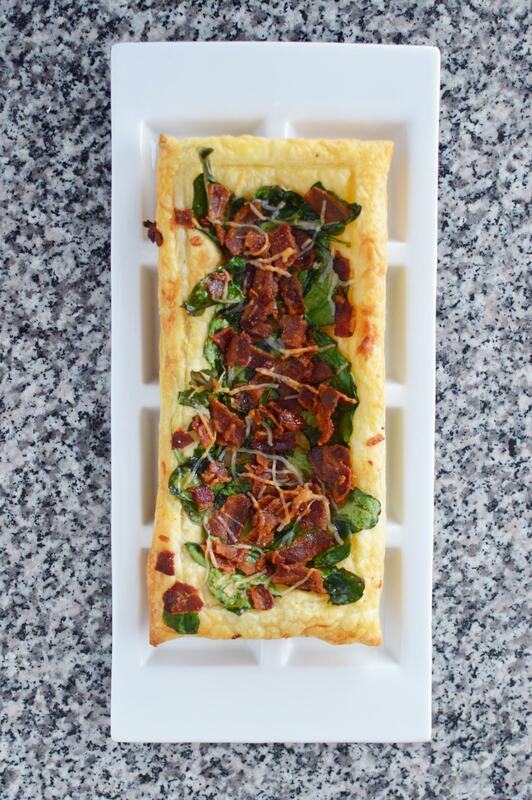 That smokey, salty flavor combined with perfectly crisped meat…. It should go on the Wonders of the World list. That’s how I feel about bacon. 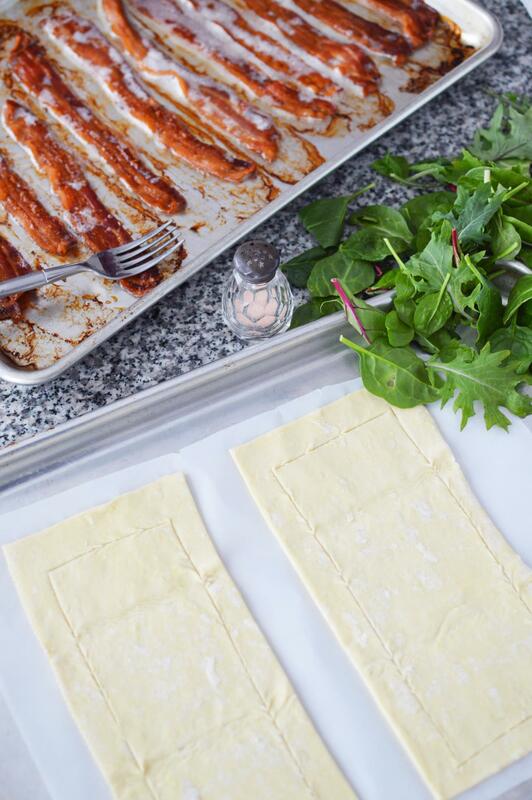 And puff pastry? That’s good stuff right there… flaky, light crisp layers of buttery goodness. When you take the two and add them together you end up with heaven on a plate. 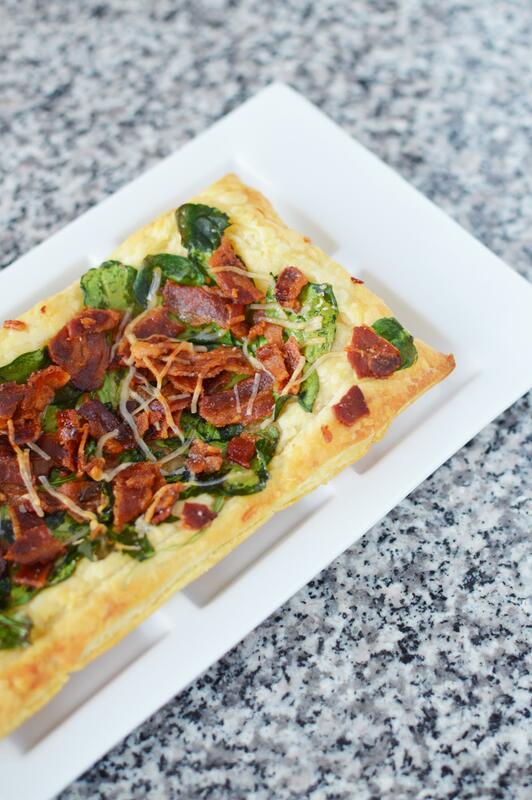 This crispy, savory bacon puff pastry makes for a fantastic appetizer. It also happens to be really easy to make. 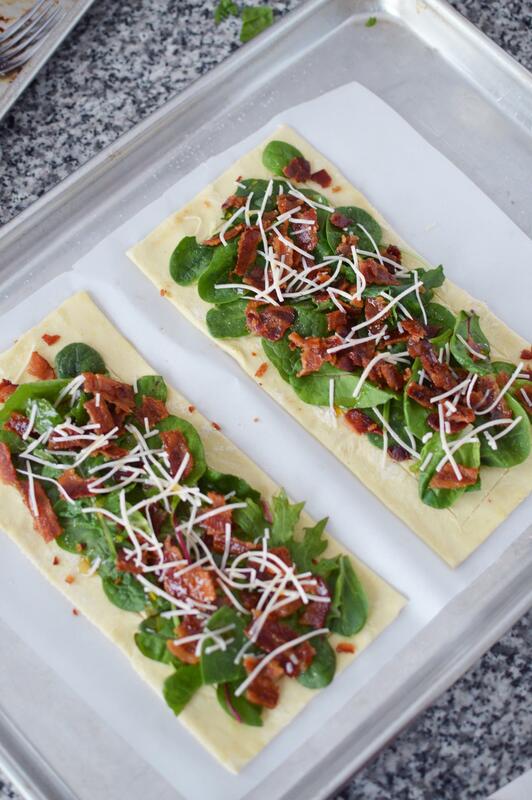 Place the thawed pastry sheets on a parchment paper lined tray. Make a light cut (not all the way through the pastry) all the way around the inside of the pastry dough, about ¾ of an inch in. This will allow the edge to nicely rise around the filling. Spread a bit of pure maple syrup around the edges of the dough. 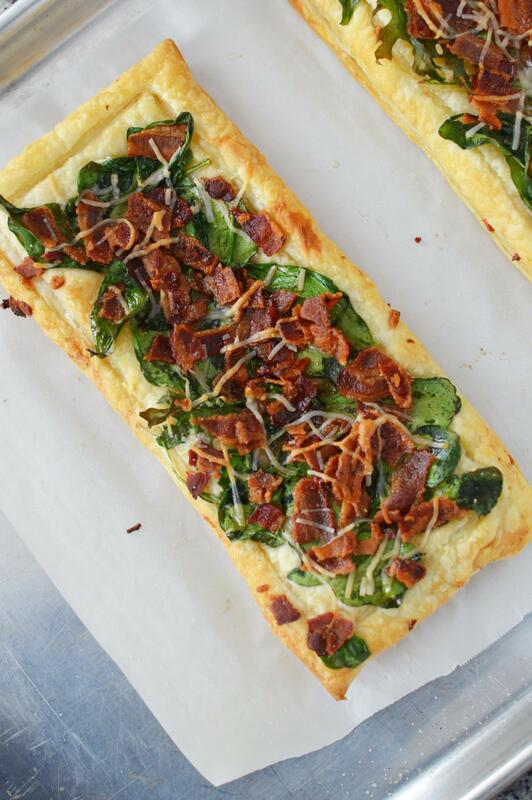 Place a layer of the baby spinach on the bottom, and then add the crispy bacon, cheese and salt. Bake at 400 degrees for about 16 to 18 minutes or until the entire pastry has puffed up significantly and is golden brown. Note: If you don’t know how to cook bacon in bulk, here is how. Preheat your oven to 425 degrees. Place the rack in the center of the oven. 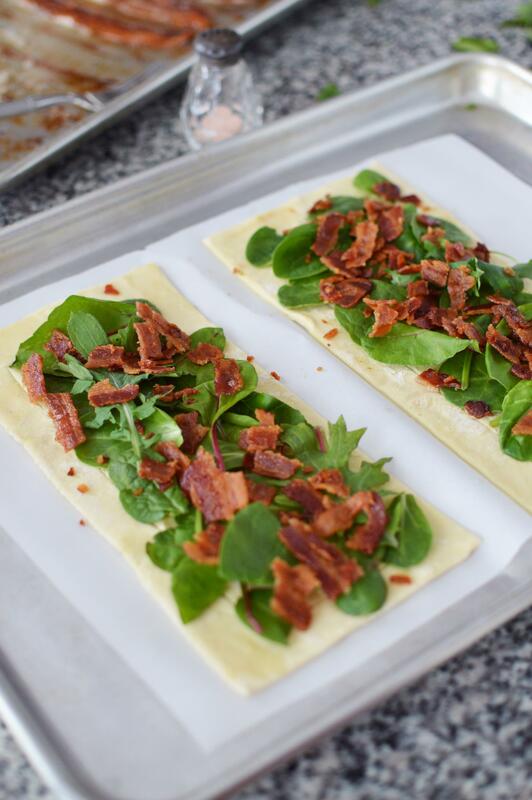 Line a baking sheet with foil and then lay out the bacon side by side, one layer only. They can be close to each other, but no overlapping. Bake for about 20 minutes. I pull it at 10 minutes and flip the bacon, then back in for the rest of the time. It’s done when it’s crispy and brown. drain the excess oil off by putting the bacon on paper towels.